ABSTRACT: The author had been assembling the sedimentation data including particle shape since 1960. All of the important influences could be defined in terms of an equation for the sedimentation drag coefficient as a function of Reynolds' number and Shape Factor, CD = f (Re, SF). Because the Sedimentation velocity of a single grain is the most accurate measure of grain size, the sedimentation equation is the basis for any sedimentation grain size analyzer such as MacroGranometer™, the advanced settling tube system extending the single grain accuracy to particle collectives. For smooth spheres, many equations have been proposed for the drag coefficient as function of Reynolds' number. Most of them can be expressed in form of a polynomial as shown in TABLE 1. Parameters of polynomial equations for drag coefficient CD of sedimenting spheres as function of Reynolds’ number Re. Equations by KOMAR et al. (1978) are given for comparison (they are not valid for spheres). For irregular particles, most experimental data on drag coefficient, Reynolds’ number and Corey's Shape Factor have been compiled by SCHULZ, WILDE and ALBERTSON (1954). 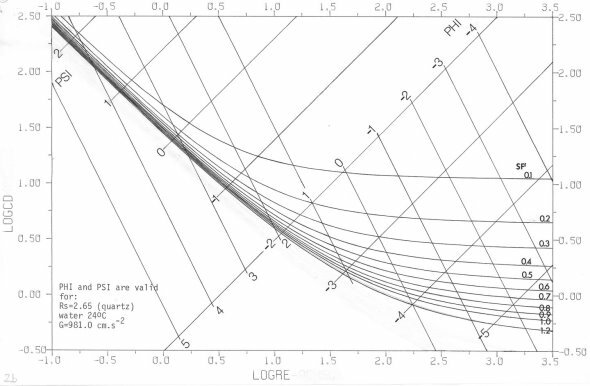 COLBY and CHRISTENSEN (1957) disclosed inconsistency in the drag coefficient definition and experimental terms of some data of SCHULZ et al., and constructed an improved the best fit plot of the drag coefficient logarithm as function of the Reynolds’ number logarithm (Nikuradze diagram) for various SF’ values. CD = A Re-1 + B Re-0.5 + C [Re < 104 ] (1) . FIG 2: Drag coefficient (logCD) as function of Reynolds’ number (logRe) for various Hydraulic Shape Factor (SF’) values in Nikuradze diagram according to eq. (1); the additional variables PHI-particle size and PSI-settling rate are plotted too as diagonal coordinates. Valid for naturally worn quartz particles sedimenting in distilled water 24°C, gravity acceleration G = 981 cm/sec2 . (see page 9 for PHI and PSI notations). FIG. 3 reveals a three-dimensional view of the eq. 1; a vertical view (map) in contour (iso)lines is shown in FIG. 4. FIG. 3: Drag coefficient (logCD) as function of Reynolds’ number (logRe) and Hydraulic Shape Factor (logSF’); naturally worn sedimenting particles; calculated from the equation (1). Comparison of some eq. (1) CD values with those by various authors is given in TABLE 2.
column (6): KOMAR + REIMERS (1978) SF’=0.3 (flat particles). FIG. 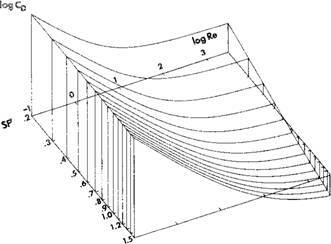 4: Contours of drag coefficient (log CD) in terms of Reynolds' number (logRe) and Hydraulic Shape Factor (SF’). Calculated from the eq. 1 using parameters of BREZINA (1977) Naturally worn sedimenting particles. The drag coefficient values for SF’=1.2 approach very closely those for smooth spheres defined by KASKAS (1964), and even closer experimental data in the range 3<logRe<4. A satisfactory agreement for SF’= 0.3 with the data of COLBY and CHRISTENSEN (1957) and with the equation (14) of KOMAR and REIMERS (1978) is evident (Table 2). While the Corey's Shape Factor is defined by three particle dimensions only, and the experimental data resulted from studies on naturally worn particles,the smooth spheres have a smaller drag coefficient value than naturally worn irregular particles with SF=1.0 (isometrical particles). This smaller drag coefficient value corresponds to SF’ = 1.2 from the eq. (1). Logically, there is a strong difference between an actually measured SF and the Hydraulic Shape Factor SF’ defined by the regression equation (see page 3). LOGARITHMIC NOTATIONS OF PARTICLE SIZE (PHI) and SETTLING RATE (PSI). Yi is a dimensionless ratio of a given settling rate, vi, in centimeters per second, to the standard settling rate of 1 centimeter per second, v0 (=vi/v0). then: K X4 + L X2 + M X + C = 0 .
n is kinematic viscosity of the fluid in stokes. G is acceleration due to gravity; the standard gravity agreed at the 1968 CGPM (Nature [GB] 220, p. 651, 1968), is the value at Potsdam, 981.260 gal . The settling rate v can be calculated as a real positive root of the equation (4) by a numerical method; the computer of the Macrogranometer employs the halving method which converges fastest. then: P Y4 + R Y2 + S Y + C = 0 . The Re and CD values are entered into the eq. (1), which can then easily be solved for SF’. This method has been used for construction of the diagrams in FIG. 7, and in the SHAPE program section of the Macrogranometer. While the particle shape strongly affects the particle size calculated from settling rate, influence of other variables is less important. b) water impurities, particularly by microorganisms (such as algae) salt, etc. b) water impurities, particularly due to salt and clay. Gravity acceleration, G, is higher by about 1 gal (maximum effect with non-spherical coarse particles). c) Gravity acceleration should be known within ±0.25 gal accuracy. DYNAMIC FACTORS causing water streaming introduce serious errors if a slow sedimentation (fine, light-weight or non-spherical particles) is involved. a) Temperature influence, such as heating, eg by radiation onto a lower, or cooling, eg by evaporation in the upper part of the settling tube. Instable stratification with a negative temperature gradient as low as -0.01°C/cm in a wide settling tube can cause streaming with a velocity which approaches the settling rate of eg. 0.05mm quartz particles (about 0.2 cm/sec). Because the static water temperature influence is much less important, a positive temperature gradient within the settling tube is recommended: +0.005 to 0.05°C/cm. b) Sedimenting suspension influence from excessive sample size sedimentation. A minimum sample size defined by statistical representativity (BREZINA, 1970) is inevitable. Analyzing large samples in parts (splits) is suitable particularly for coarse material. The Macrogranometer program segments "Split Cumulation” and "Mean" make this technique fast and easy.